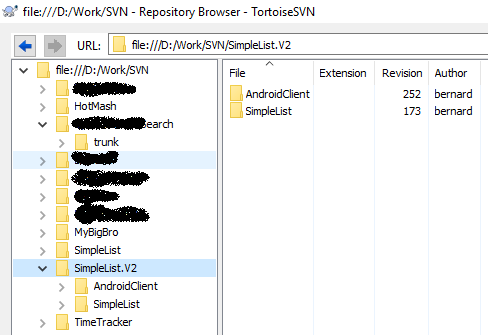 I have a SVN repo on my local machine that I have been shoving stuff into since before I knew how to use revision control systems properly (I still don't). Each of the directories in my repo represents a separate project. Some of my directories have a proper trunk/branches/tags structure, but most don't. I want to migrate each of my SVN repo's directories into it's own new respective git repo, retaining all historical commits. This tool is a ruby gem that essentially wraps the native git feature for managing svn-to-git migration - git-svn. If you use svn2git's "--verbose" flag, you can see what commands it is issuing to the wrapped tool. 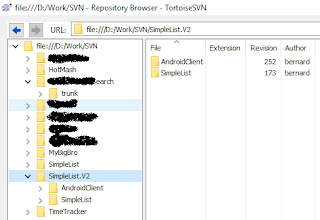 The reason I decided to blog about my experience was because I had a bit of trouble with the documentation and a bug with the svn2git tool. Mostly the tool is great, but for my particular purpose, I needed the "--rootistrunk" flag, which as it turns out, doesn't work. Instead (as the following Stack Overflow issue reports - https://github.com/nirvdrum/svn2git/issues/144), you can work around this by using the "--trunk", "--nobranches" and "--notags" flags. The following image shows what your file containing sensitive data's historical commits will look like on GitHub once you have run across it with BFG. Git's native functionality for this purpose only allows you to get down to the file level (delete files), whereas BFG enables you to search/replace specific text in files across the entire history of your git repo, which is fantastic. Once you have this file, using can use the svn2git "--authors" option to specify the file that you've specified mappings in (would be "authors-transform.txt" if you used the above command to get the information). 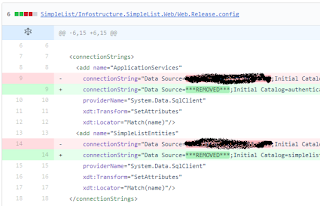 Clearly I forgot to apply this step before kicking off the migration for my SimpleList.V2 codebase. Bugger. If like me you forget to do this, nevermind, you can use the following approach to modifying the author of historical commits (if you can be bothered) - https://help.github.com/articles/changing-author-info/. Create a new GitHub repo to push your code into. Note that if you have elected to add a ReadMe and/or a .gitgnore file on GitHub, that will need to be pulled and merged with your local repo before you can push it all to GitHub. I're retrospectively changed this blog post to make it into what are hopefully independently applicable sections. I've built this procedure up over a little while; it's essentially a piecemeal template for open-sourcing historical codebases on to GitHub (or any public git repo) using a few well-established tools. Have fun!